Report of a case of molluscum fibrosum, or fibroma; with observations. Journal : Medico-chirurgical Transactions, vol. 38. London : Longmans, Green, Reader, and Dyer, 1873. Description : pp. 255-266, [1 l.] pl. ; ill.: 1 leaf photos., 1 engr. ; 23 cm. 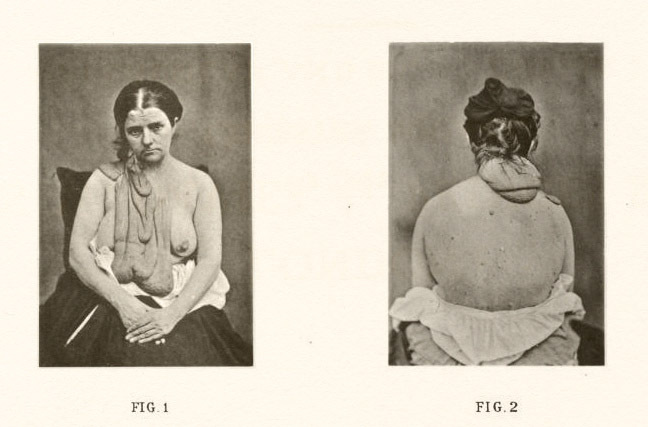 Photographs : front and back views of the subject; autotype. Subject : Skin — Hypertrophic disorders ; Molluscum. Author caption: GEORGE POLLOCK, F.R.C.S., SURGEON TO ST. GEORGE'S HOSPITAL. Surgeon in Ordinary to the Prince of Wales (later, King Edward VII). Son of British Field Marshall, Sir George Pollock. It is difficult to give any exact description of the characteristics of this peculiar case, as no verbal account would accurately convey a right impression of its singular appearance. Photographs or drawings could alone illustrate its various conditions, and these have been secured and accompany this communication, while the patient herself has consented to be examined for the satisfaction of any one interested in the subject. — p. 256. Dr. Pollock operated successfully. In 1876 he had the opportunity to surgically treat a second case, much more severe than this one, ending in death. Recklinghausen included Pollock's second case in his monograph on multiple fibroma (Berlin, Hirschwald, 1882).